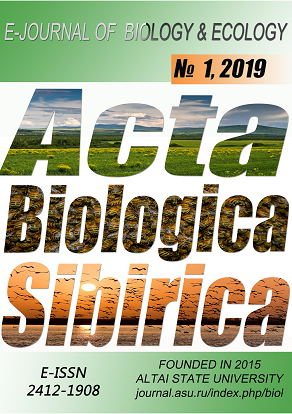 The article investigates the abundance of beetles of the genus Amara in the agrolandscape of the Leningrad Region. In the period from 2004 to 2010, 14 Amara species were collected by pitfall trapping. Amara fulva (O.F. Müll.) is the most common species in the potato and clean fallow fields, Amara similata (Gyll.) – in the grain and grasses fields, and A. communis (Pz.) ˗ in adjacent semi-natural habitats respectively. The cluster analysis shows that assemblages of ground beetles of the genus Amara in fields of different crops, field boundaries, and adjacent habitats are separated from each other. In the agrolandscape, the population of beetles of the genus Amara reaches its greatest species richness and abundance in perennial grassfields. In addition, to our best knowledge, this research was a first time when Amara ingenua (Duft.) was observed feeding on the flowering spikelets of timothy grass (Phleum pratense L.). Andersen, A. (1992). Predation by selected carabid and staphylinid species on the aphid Rhopalosiphum padi in laboratory and semifield experiments. Norwegian Journal of Agricultural Sciences, 6 (3), 265–273. Guseva, O.G., Zharina, N.L., & Zhavoronkova, T.N. (2010). Species composition and dominant structure of ground beetles and rove beetles (Coleoptera: Carabidae, Staphylinidae) in orchards of Northwestern Russia. Plant Protection News, 4, 24–31 (in Russian). Koval, A.G. (1999). Contribution to the knowledge of carabids (Coleoptera, Carabidae) preying on Colorado potato beetle in potato fields of the Transcarpathian Region. Entomological Review, 79 (5), 523–532. Lindroth, C.H. (1986). The Carabidae (Coleoptera) of Fennoscandia and Denmark. Leiden; Copenhagen: Scandinavian Science Press Ltd, Leiden, Copenhagen, 228–500. (Fauna Entomologica Scandinavica, 15, 2). Tooley, J., & Brust, G.E. (2002). Weed seed predation by carabid beetles. The agroecology of carabid beetles. Andover: Intercept, 215–230. Tooley, J., Froud-Williams, R.J., Boatman, N.D., & Holland, J.M. (1999). Laboratory studies of weed seed predation by carabid beetles (1999). The BCPC Conf. : Proceed. Intl. Conf. (Brighton, 1999). Farnham: British Crop Protection Council, 571–572.